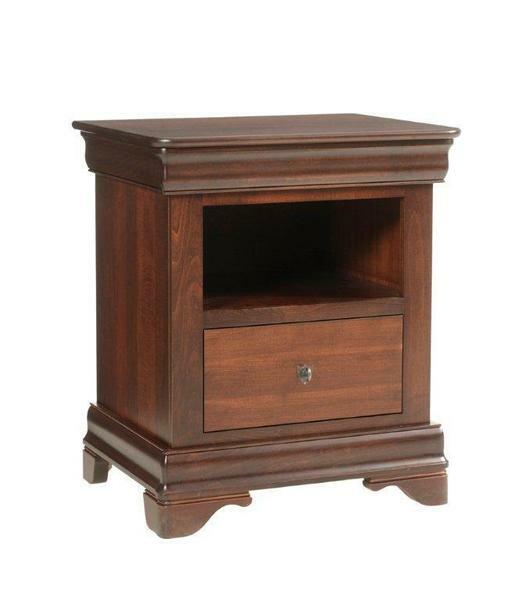 Bring the luxury and natural beauty of handcrafted Amish furniture into your bedroom with our Versailles Nightstands! Made with the finest North American hardwoods and crafted with the care and quality you'd expect from an Old-World Amish wood shop, the Versailles Collection will offer you and generations after, years of continued use and enjoyment! With the perfect space to place your nighttime reading material and fun decor, a full-extension lower drawer and a hidden jewelry drawer, you'll have plenty of room for all of your bedside items! Add the aromatic cedar drawer bottom and the smooth full-extension undermounted soft close drawer slides to complete that flawless look and add the wonderful, fresh cedar scent to your new nightstands! Call one of our Amish Furniture Specialists today to start your order by phone and request your stain samples, so you can be sure your new nightstands will look perfect with your unique bedroom decor!